Artist talk: Saturday 20th August, 1.45pm, Free, open to all. Walk & Talk: Wednesday 24th August, 2pm, Free, open to all. 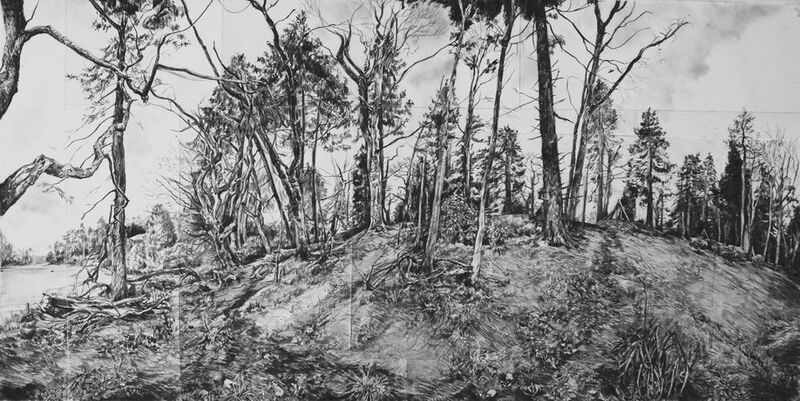 Penarth Pier Pavilion is delighted to present a major exhibition of drawing, installation and sound from recent Royal Drawing School Alumnus Geraint Evans: Edgeland. Penarth Pier Pavilion is delighted to present a major exhibition of drawing, installation and sound from recent Royal Drawing School Alumnus Geraint Evans: Edgeland. This is the first solo exhibition from Evans since completing the postgraduate diploma at the prestigious school where he now teaches as part of the Drawing Clubs Faculty. For Edgeland, Evans presents a focal installation, comprising of sculpture and sound with a burnt out car as the central piece: ‘Monolith (horizontal)’. This semi-autobiographical, multi-sensory installation delves into personal memories of childhood playing in a scrap of woodland that backed his estate in west Cardiff. The work explores the notion of destruction as a form of creation and considers what it takes to break the negative social cycles of estate life. The nowhere bits of scrub-land that lies between where our cities become more dilute and our countryside begins is where you will find the Edgelands: spaces as transient, evocative and visceral as memory itself. Edgeland explores the wilderness of memory; a word unclear as to what events are fabricated and what are recalled accurately from reality; recollections where factual experiences, almost within grasp, meet belief and imagination. Evans presents these coming of age events as legend. This exhibition was made possible with support from Arts Council of Wales, with special thanks to Pengham PartMart and sonic art collaborators James Holland and Nick Perry.